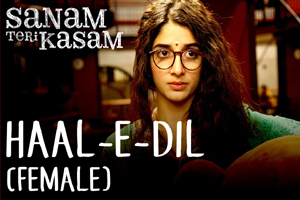 A song sung by Neeti Mohan featuring Harshvardhan Rane, Mawra Hocane. The audio of this song is available on YouTube at the official channel Eros Now. This audio is of 5 minutes 35 seconds duration. Lyrics in Hindi (Unicode) of "हाल-ए-दिल (फीमेल)"